Losing Steam In Smartphones, Chinese Firm Turns To Smart Rice Cookers : All Tech Considered One of China's most valuable tech startups, smartphone maker Xiaomi, is getting into networked appliances, in a bid to innovate its way out of trouble, as its core business falls flat. An exhibitor shows a smart rice cooker to a visitor at a display booth for MiJia, a new brand by Xiaomi at the 2016 Global Mobile Internet Conference in Beijing on April 28. One of China's most valuable tech startups, Xiaomi, is trying to innovate itself out of a bind. With its core smartphone business struggling, the company is turning to networked appliances — sometimes referred to as the Internet of things — to revive its fortunes. Xiaomi burst on the scene five years ago, and as of 2014, it was outselling Apple and Samsung in China. Part of its success was due to its use of social media and online sales, but the company seems to have exhausted that market. "Our online sales were growing so fast we thought they would soon account for half of all sales," says Su Jun, who heads the company's appliance arm. "But we discovered that at a certain stage, we began to run into bottlenecks." This is important because, as its economic growth slows and factories fall idle, China is pinning its hopes on its booming e-commerce sector. But many Chinese consumers still live in rural areas where Internet and road networks lag behind the cities. 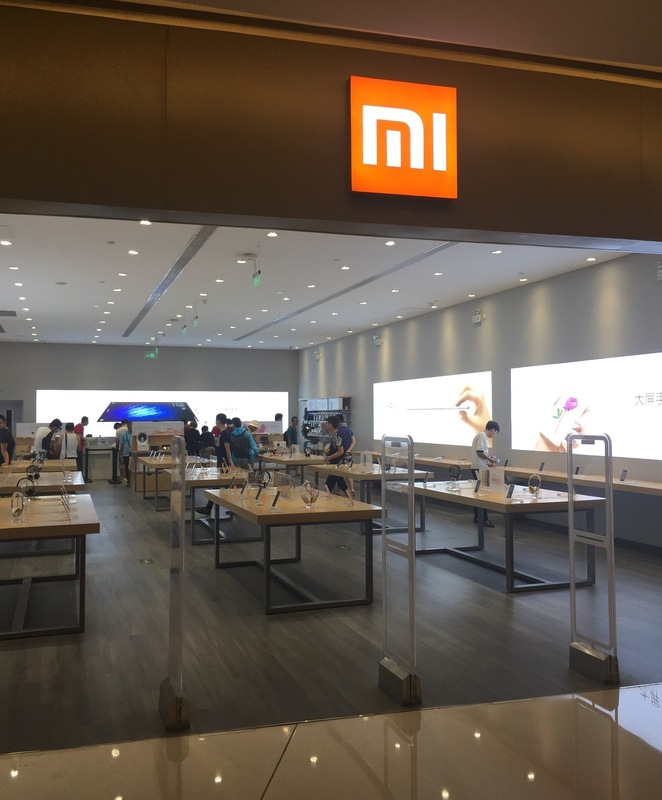 All of this is what brought me to one of Xiaomi's new brick-and-mortar stores, which the company has recently begun opening in search of new customers. They actually look a lot like Apple stores, with phones displayed on long wooden tables. But they also have flat-panel TVs, carbon fiber bicycles, and Segway-like scooters. 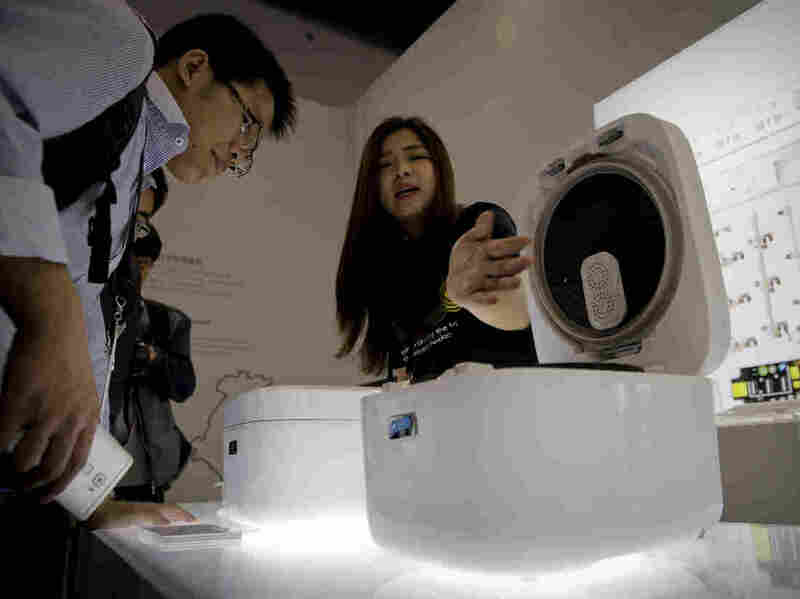 Xiaomi is trying to rethink appliances, to make them inexpensive, sleekly designed, equipped with sensors to collect data, connected to the Internet and controllable with a smartphone. After starting small, producing $10 phone power banks and other phone and computer peripherals, the company began designing appliances for the smart home, including lighting, air purifiers, water filters, Wi-Fi routers and the like. 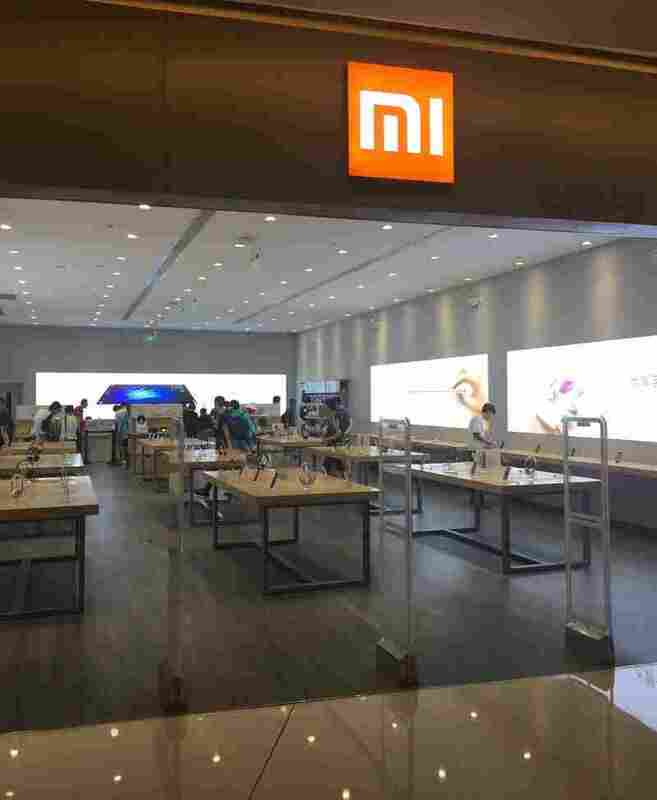 As Xiaomi exhausts the online market, it has begun to open brick-and-mortar stores, like this one in in Beijing, to reach more customers. Instead of manufacturing the gadgets itself, the company invests in dozens of startups that do it for Xiaomi. Su Jun admits his company is hardly the first to make networked gadgets. But he says it makes ones that do things that Chinese customers really care about. He shows me, for example, a high-tech rice cooker. "You scan a code on the packaging, and it will automatically identify where in China the rice was grown," he explains. "It will also detect the altitude you're at, and adjust the pressure in the cooker accordingly, all of which will make your rice extra delicious." And that goes for Japanese and Thai rice, too, he adds. Su says Xiaomi is creating an "ecosystem" of networked appliances to get customers to buy more products. He adds that it can cut the cost of making its products by up to half, thanks to high sales volumes and lightning-fast turnover. "Many of our products can be made in the factory, loaded onto trucks, shipped to warehouses, and delivered to customers all in one day. How efficient is that?" he says. Like Apple, Xiaomi has a base of millions of young and worshipful fans. They follow the company's every move on social media, and flock to product launches as if they were rock concerts. The company's name, by the way, has two meanings. The first is MI, short for mobile Internet, which was the company's initial focus. Secondly, Xiaomi is Chinese for millet (the grain). This reminds many Chinese of the phrase "millet and rifles," which is about Chinese soldiers having to fight against the U.S. during the Korean War. In other words, it connotes an underdog. In the cellphone market, Xiaomi has recently gone from top dog back to underdog. On the low-cost end, Xiaomi has been eclipsed by rivals that have bigger networks of brick-and-mortar stores in China's hinterland. In the premium market segment, Xiaomi has had difficulty keeping fans who want to upgrade their smartphones, because it has fewer offerings. "The low-price strategy may have gained it lots of fans early on," says Jin Di, a research manager with the Boston-based consulting firm IDC. "But it's not a long-term development strategy." At any rate, Jin says Xiaomi's experience offers answers to questions foreign investors are curious about: "What are startups in China doing? What business models do they choose? What kind of customers are they trying to attract, and what services can they provide?" Despite the setbacks, Jin thinks Xiaomi's prospects still look bright. She predicts that the market in China for networked appliances will double by decade's end.